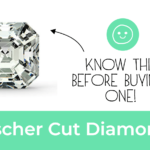 The diamond color plays an important role when buying a diamond. It largely influences the perceived sparkle and fire of a diamond. It’s a bit counterintuitive, but the best diamond color is actually colorless, which might make you wonder why we talk about color then. Let me explain. Firstly, most diamonds are not perfectly colorless. Rather their natural color ranges from barely visible to very intense shades or tints of yellow/brown. Different shades of the diamond are categorized on a diamond color scale that ranges from D to Z. D is a perfectly colorless diamond and Z is a yellow color diamond. 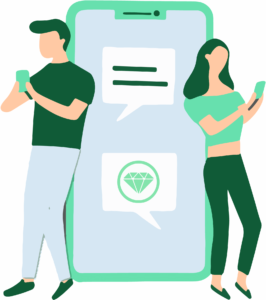 Side note: we are not talking about fancy colored diamonds here such as red, blue or brown diamonds. You can find the different color grades in the diamond color scale below. 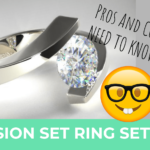 In the following I’ll explain how the color shades affect the sparkle of the diamond and which ones would eventually give that icy-white look on a diamond without you having to pay for the most expensive grade. 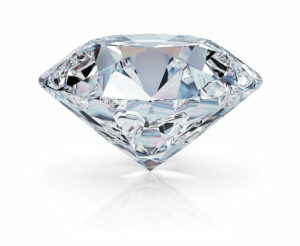 When light enters a diamond, there is prismatic facet: The light bounces which results in what is termed, ‘fire’. 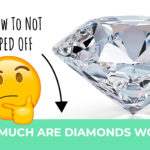 If you notice any color in the diamond, it’s its light reflection (much like that of clear water) and not so much that of the actual diamond color (which is colorless). Eventually, reduced transparency and scintillation are the resultant effect of lower color grades as classified by the diamond color scale. In other words, the relationship between the color of diamonds and light absorption is inversely proportional. Hence, you get better visible sparkles and light absorption from a diamond that is more colorless. 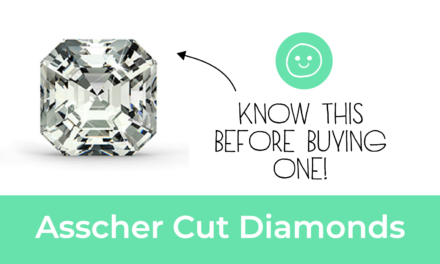 However, that doesn’t mean you have to buy the highest graded diamond color…keep reading. Firstly, the color range of diamonds ranges from D (colorless) to Z (yellow/light brown) on the diamond color scale. It’s actually difficult to evaluate a diamond’s color with the naked eye when it is faced up. 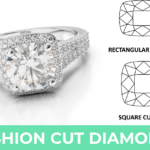 Therefore, gemologists turn loose diamonds face down to grade them on a white surface. 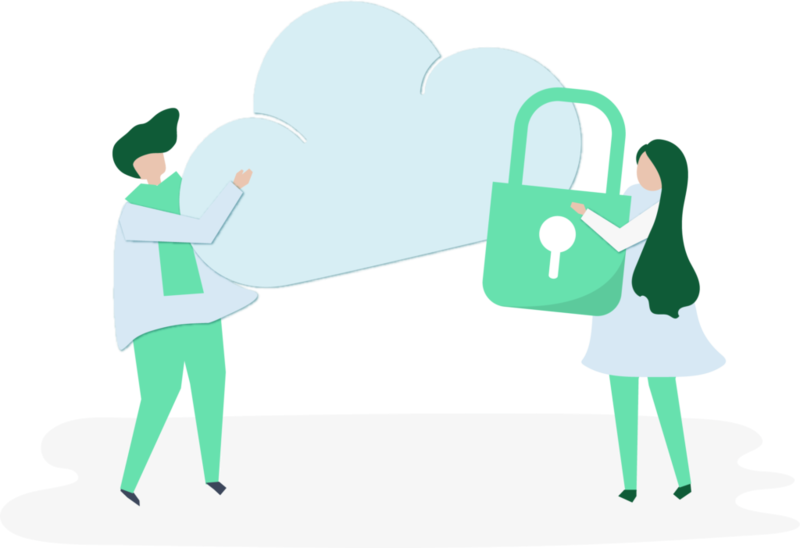 For untrained eyes this is still a difficult task and knowing this will help you to save money. On the top of the diamond color scale you will find the rarest diamonds in the world. These are within the colorless range that supposedly represent the best diamond color. For example, you would observe no color from the D and E colored diamonds with the naked eye. Therefore, they get called icy-white. In F colored diamonds you will find an almost undetectable hint of yellow color, but to see that it would have to be viewed face down by a gemologist. Moreover, when comparing an F colored diamond with a D colored diamond you couldn’t tell the difference. These types of diamonds are best placed in white gold or platinum. For instance, yellow gold and other colored ambience would take away the high luminosity of the color grades. While facing up, the diamonds within the almost-colorless range look colorless. But if they are placed face-up, they exhibit a very minute amount of body color. Therefore, you have to view them against a perfectly white background to be able to see it. However, you may not be able to detect the color as a layman when the diamond gets mounted on a ring setting. That’s why, going by this explanation, you might want to go for the near-colorless diamonds on the diamond color scale. It will definitely save you some money. 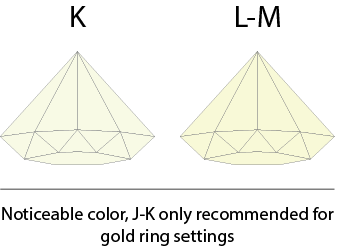 You get a slight hint of color from the K to M graded diamonds. They are more favored by those who like the warmer look. 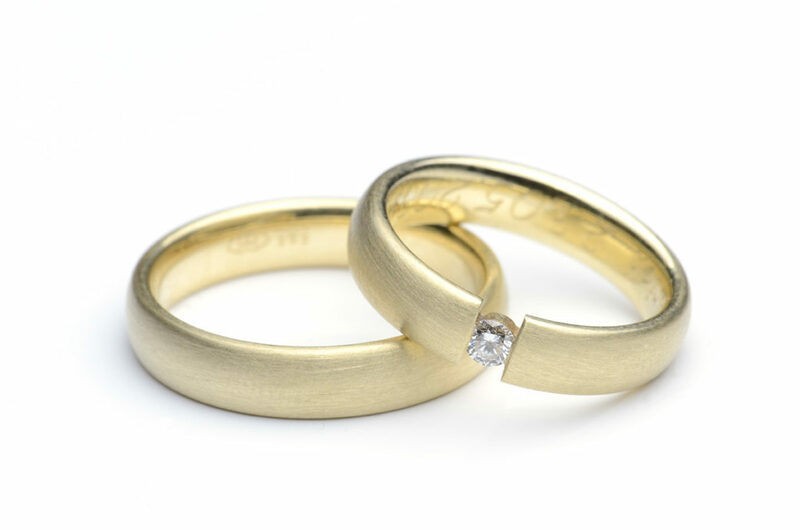 People who wish to set their diamond in a yellow gold ring see this as their best option because the diamond picks up quite a lot of color from yellow gold ring setting. Diamonds graded N to R have a strong yellow tinting, S to Z even stronger. Thus, I usually don’t recommend this grade for an engagement ring. Diamonds usually end up on a ring setting. The color of the ring setting can have quite an effect on the diamond color. 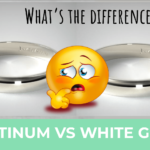 Diamonds in white gold settings do not adapt as much color from the metal compared to those placed in yellow gold setting. Money saver: For this reason, you don’t have to go for the best color grades when you wish to mount them on yellow gold. 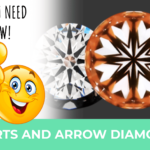 Have a look and compare these diamonds on yellow and white gold settings. It is very obvious that the ones in yellow gold absorb more color from the ring. Some diamonds exhibit fluorescence. This is always mentioned in the grading report, irrespective of the degree. 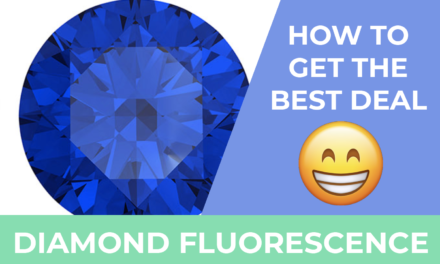 If you wish to go for a diamond in the I-K color range to save money, you should consider the diamonds with medium or strong blue fluorescence especially because you can get a discount on those ones. That said; remember that I am not recommending that you buy a diamond with fluorescence. Except you are going for this particular color range. In summary, G remains the most popular grade. However, that doesn’t mean you have to go for this grade to save the most. As long as you don’t choose a color grade better than G you are fine. For instance, chances are you won’t be able to differentiate between G and D if they were held next to each other. The only place you will see a difference is in your pocket! 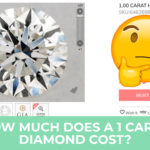 Therefore, only when a diamond is 2 carats or above you might want to consider buying a higher color grade because the larger the diamond the more color they trap and exhibit. For example, taking a 0.5-carat diamond and a 3-carat diamond and examining them side-by-side, the smaller one would appear more colorless. Even experts of diamond grading from AGS and GIA can only compare diamonds by putting them close to a set of master diamonds. Furthermore, they also do this under the best possible lighting condition. 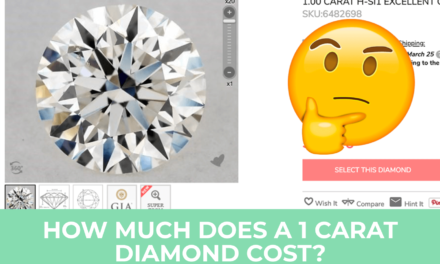 In summary, what’s the best diamond color in the world? Well color grade D, but that isn’t the best option you’re your engagement ring! 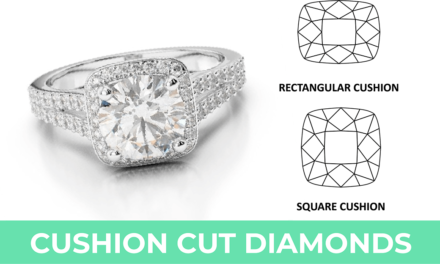 The best pick for a diamond color grade is greatly influenced by the type of ring metal you intend to use. 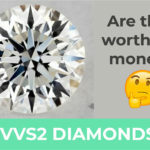 To get the best value for your money this means getting the diamond that would definitely appear as colorless as possible and those are basically G and below. Everything considered, I also understand that the best diamond color is subjective and the final decision is still yours to make. 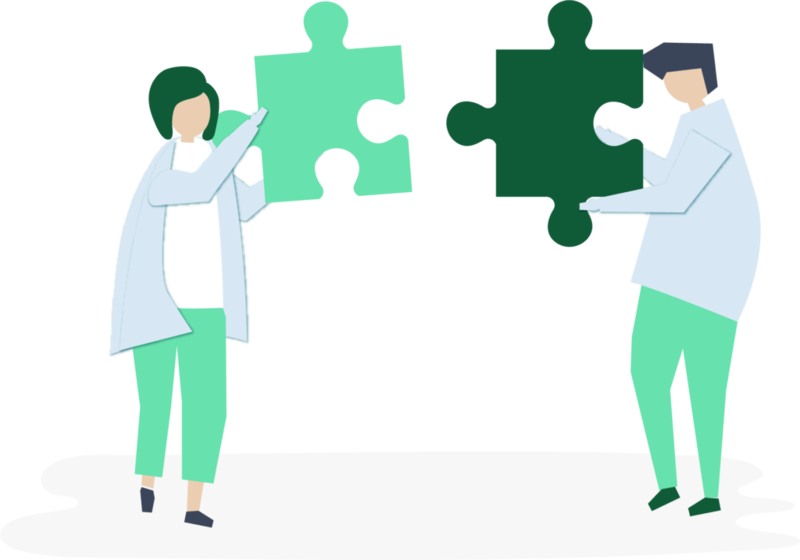 You might be a perfectionist who only wants the best. 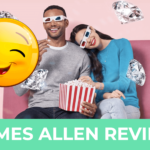 To sum it up, if you don’t know where to buy your diamond yet, I recommend checking out James Allen’s website. Lastly, to find more blogposts visit our homepage.